My Shopping Genie Review: Do You Need This Savings App? With the various search engines available shopping online has become overwhelming. You cruise from site to site hoping that you find the same deal your best friend found on those Steve Madden shoes. But after searching on the 14th page of Google you come up empty. What if there was an easier way to shop and see everything that you need is on sale? This is exactly what you get with My Shopping Genie. It is your one stop for all your buying needs. My Shopping Genie is a revolutionary savings application that lets you save money before you pull out your wallet. By simply downloading the application to your computer you can comparison shop on millions of products. You use your favorite search engine like normal for what you are looking for and on the far right of your screen you will see the Genie. It pulls at the best deals from Amazon, Costco, Wal-Mart, eBay, and other top shopping sites. It will also allow you to compare between sites. My Shopping Genie lets you search for deals and search for coupons with no hassle. No need to go searching for specific coupon codes the Genie does it for you. The Genie even shows you a map of where your deals are and how far it is from your home. The company, MyNet Universe knew that this would be such a need in the market place that they decided to charge a small price of zero dollars to each person looking to save hundreds each month. You read right the application is absolutely FREE to use. If there is one thing that we cannot get back time is on top of the list. Many of us live busy lives that requires us to get information quick and easy. But our old methods of price comparison shopping typically meant that we drove from store to store in search for those bargain deals. Sometimes you would see the same people at day at the same store because they’re looking for deals too. With My Shopping Genie you no longer have to use waste your time and gas in search for the best deals. The deals come to you with one click. You choose the best deals online and offline. Money is an absolute necessity and to some it’s like air you have to have it. With this economic climate people are looking for any way to save. Consider My Shopping Genie your automatic savings plan. By using it every time you shop you save money to the tune of $300-$500/month. If you are like me this is a significant savings amount. If you would let yourself day dream what would you do with an extra $500/month? The options are endless and either way it can relieve financial stress. Many companies are turning to the network marketing industry to promote their products and this is the case with MyNet Universe. My Shopping Genie users often turn into distributors. With the application being free how does a distributor make money? Every time a person uses the Genie to price comparison shop the distributor gets a commission. If that same person purchases something online the commission increases. The company also offers additional incentives and bonuses for its distributors. With 789 million online shoppers globally this is a goldmine opportunity for anyone looking for true passive wealth. This is also the ultimate fund-raising opportunity for any non-profit organization, small business, or church. 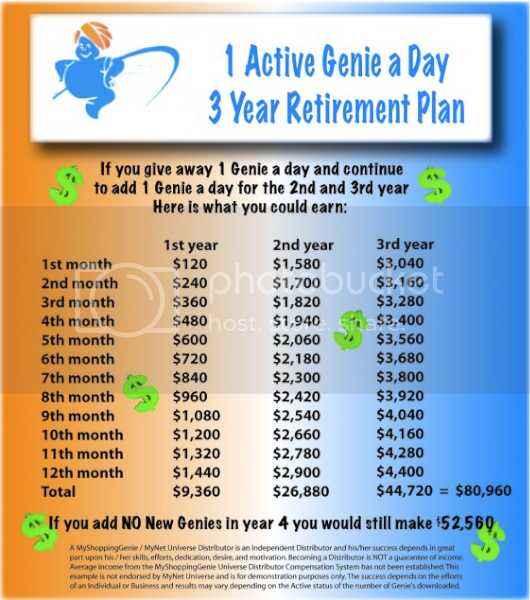 By just having your employees or members use the free Genie it benefits the organization. This leads into one of the best features the My Shopping Genie offers its distributors. Each distributor who has a business, company, or organizations group can brand the Genie with their own logo with clickable links to their website. In short each Genie given away will have the business logo on it resulting in free advertisement real estate. To be a distributor you must have a license to give the savings application away. The license fee is $200 with a monthly maintenance fee of $29/month. Now the only question that remains is how many Genies can you give away. This innovative online shopping application can save you time and money and even make you money. Anyone who shops online or in their local stores will see big savings in their bank account each month as a result of comparison shopping using My Shopping Genie. Get The Free Genie Application and Test Drive It TODAY!